Today’s review is set in space where explorers are trying to colonize planets through democratic or economic means and claim them for their galaxy. I’m talking about Tiny Epic Galaxies. Tiny Epic Galaxies is a game I wanted for quite awhile. It was first recommended to me when I was looking for recommendations for solo games on the board games subreddit. I checked it out and I liked the sound of it. I also liked that it plays both solo and multiplayer. Then I watched the TableTop episode where Tiny Epic Galaxies is played and my longing for the game grew. So when my husband asked what I wanted for Christmas, Tiny Epic Galaxies was what I said. Ripping open the paper on Christmas morning and seeing that Tiny Epic Galaxies was indeed what my husband had chosen for me brought joy and warmth into my being. I immediately began to look over the game’s components and read the rule book. Of course, the Christmas season is a rather busy time for my family, especially since there was a new baby, so I didn’t end up playing the game until the new year. But once I did, I couldn’t stop. My first play of the game was a solo play and I lost horribly. Unless you always play games solo, I would suggest playing against a human opponent the first time you play, for it was my second time playing, when I played with my husband, that I found the game really started to stick for me. The rules can be a bit daunting for new players, as I discovered when I played with a full count of five players and three of those players were new to the game. There’s a lot of symbols and terminology to keep in mind, but it does get easier to remember the more you play. Players begin the game with 2 ships, 2 Energy points, 1 Culture point, and can use 4 dice on their turn. The number of ships and dice used go up when players choose to upgrade their empire (more on that in a minute). Energy and Culture points are collected as resources via dice rolls. Each player also is dealt two secret mission cards and can keep one. These can be the difference between winning and losing, so they are important. The starting player set up. There are also planets placed in the middle of the playing area. The number of planets varies based on player count, with their being 2 more planets than there are players to a maximum of 6. The planets all in a row. On a players turn, they roll the dice and can choose to solve them in any which order they please. Players also receive a free re-roll per turn. Further re-rolls must be paid for with Energy points. Players can also choose to convert a die, which can be done only once per turn. To convert, a player needs three inactive dice. They can then spend two of those die (make them unusable for the turn) to convert the third die into whatever symbol they want. There are six different symbols that can be rolled. The first of these is to move a ship. Players who roll this can choose to take one of their ships from their Galaxy Mat and either land or orbit a planet. When a player lands on a planet’s surface, they can immediately take the action listed on the card. When a player chooses to orbit a planet, they place the ship on the landing area of the colony track. This is how planets are colonized and players must reach the end of the colony track to claim the planet. The ships are moved along the colony track by rolling either Democracy or Economy, the second and third symbols. These symbols are marked on the cards so players will know whether they are trying to colonize a democratic planet or an economic planet. For each of the Democracy and/or Economy symbols rolled, players can move one space ahead on a colony track of one planet. So if a player is on the colony track of two planets that need Democracy to advance, and the player only rolls one Democracy symbol, they must choose which planet they wish to advance on; they can not advance on both. Each planet is worth a certain number of victory points marked on the card. When a player reaches twenty-one victory points, end game is triggered and play continues until each player has had an equal number of turns. The fourth and fifth symbols are the main resources of the game, Energy and Culture. When a player rolls and activates a die with an Energy symbol, they are awarded one Energy point per ship on or orbiting a planet that produces energy as well as any ships on their Galaxy Mat. Culture points are only awarded, when rolled, on planets that produce Culture. These resources become very valuable in the game for different reasons. Energy points are mainly used to pay for re-rolls after a player uses their free re-roll. Culture is used for what is probably the most confusing part of the game: following an action. Each time a player activates and uses a die, any other player may pay a culture point to “follow” and they too can use that action. The action does not have to used in the exact same way when following, but it still has to be a legal action of course. The last symbol is Utilize a Colony. When a player rolls this symbol, they can utilize the die to either upgrade their empire or use the special ability of one of the planets they have colonized. Upgrading the Empire is important as different levels unlock new ships or allow players to gain a die. Higher levels of empires also garner players victory points. To upgrade, players must spend Energy OR Culture equal to the next level of empire. As for those secret mission cards, players, at the end of the game, who have completed their secret mission, garner the victory points awarded by the card. These do not count towards the twenty-one points needed to trigger end game, but are an addition. For a game that calls itself “Tiny”, there’s definitely a lot going on. Tiny Epic Galaxies can play up to five players, but my experience with a five player game leads me to tell you to not play it at that high a player count. I found the game overstayed its welcome at five and was far too long for what it is. Lower player counts seem to be best for the game to really shine. I have personally enjoyed it a lot at two. The quality of the game is good. The box is nice and thick and the artwork suits the game. The wooden ships and counters are nicely made. My only issue is that the purple galaxy has black ships and pieces, while all the other colours have matching ships and pieces. Also, purple is not the most common of game colours so purple would’ve been an interesting choice. The purple galaxy with black pieces. Note the small energy symbol on the number 2. The Galaxy Mats are fairly well laid out and even have a small symbol to show the starting Energy and Culture points, albeit, it may be a bit too tiny for many people to really understand what it symbolizes. There is also a reminder of what the Energy and Culture points are mainly used for on the Galaxy Mat, kind of like a player guide. There is also an Activation Bay where players can place their active dice and also acts as a player aid by having a list of the die symbols and what they can do. However, there is only one of these and it can be a pain passing it around the table. While it would increase the footprint of the game, I believe that an Activation Bay per player would help. The dice are readable and the white on black I think matches the game better than the opposite would. As a solo experience, the game is slightly transformed. Gameplay for the solo player is largely the same. However, the player is also rolling for a Rogue Galaxy. The Rogue Galaxy is represented on the opposite side of the regular player Galaxy Mats, with different difficulties listed on the left-hand corner. I have personally only played with the beginner Rogue Galaxy. The Rogue Galaxy differs from the player mats in that the Rogue Galaxy produces Energy and Culture, so they can gain Culture points by having ships on their galaxy. The other difference is that they begin the game with all four ships, but zero Energy or Culture. When players roll for the Rogue Galaxy, each die is rolled individually. If the die is usable by the Rogue Galaxy, it is placed on the Activation Bay and utilized. If the die is not usable, the die is rolled again and if it is still unusable, the die is withdrawn from play for the round. This continues until the Galaxy has rolled all of their allotted dice. There are major differences with what happens when the Rogue Galaxy rolls certain symbols. When Move a Ship is rolled, the Rogue Galaxy flies one of its ships to the colony track of the leftmost planet they are not already orbiting. The Rogue Galaxy can not land on a planet’s surface. When either Democracy or Economy are rolled, all Rogue ships orbiting a planet with that symbol move up one space on the colony track. They also can colonize the planet and claim them. They win the game if they reach 21 points or more. The Rogue Galaxy does not use their resources the same way players do. The method of gaining them is the same, except that their galaxy produces both Culture and Energy, but instead of spending these on re-rolls and following, they are spent on special actions once maxed out. They can only be done once per turn. At max energy, the empire is upgraded, which garners the Rogue Galaxy victory points but also extra die and a stronger attack. At max culture, the Rogue Galaxy gets another turn following their current turn, with three dice. The special actions may not re-occur during this turn. After these actions are taken, Culture and/or Energy points are reduced to zero. The last difference it Utilizing the Colony. Instead of using this to upgrade their empire or to utilize a colonized planet, the Rogue Galaxy can use this die once per turn to attack the player. The attack changes based on the empire level of the Rogue Galaxy. Once the Rogue Galaxy reaches the top level, they also win the game if twenty-one points hasn’t been reached first. The solo game has proven to be challenging and I have not won a game yet. I’m still on the first level of difficulty of five levels, so this will be a game that will provide a challenge for quite some time and offer many replays. Tiny Epic Galaxies is published by Gamelyn Games and designed by Scott Almes. 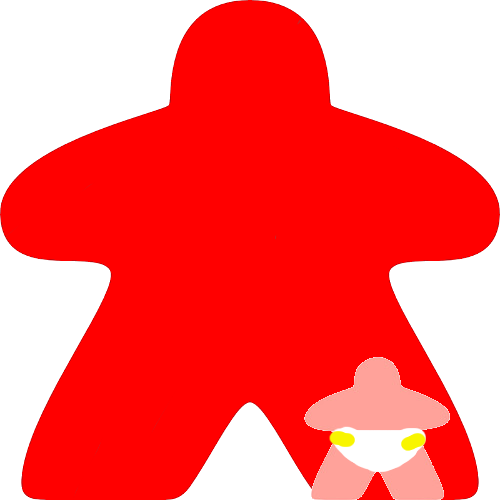 Don’t forget to sign up for our mailing list to keep updated on all the happenings here at Meeple Momma. I really enjoy this game, though I don’t own it. I have a couple of friends who do, so I don’t need it in my collection. But I’m always up for a game! I love me some dice rolling, and the mechanics of this game are really interesting. It’s in my top 10 for sure. I like dice too.